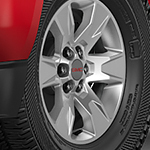 2019 GMC Canyon: Soft to the Touch and Comfortable | Holzhauer Motors Ltd.
We at Holzhauer Motors Ltd. believe in vehicles that offer comfort at least as much as they offer power and performance. The good news is that we have tons of these types of vehicles as well, including the 2019 GMC Canyon. The features make this vehicle one of our star vehicles in our inventory. The seating has been designed specifically for the comfort of the driver with the option of heating for people who are in the front seats. This can provide a lot of relief in colder environments on colder days because of the technology of the vehicle. Other features to consider for your vehicle include the instrument panel that is soft to the touch as well as noise reduction. This vehicle shows that automotive brands do not just think about powerful engines and performance. They understand that a vehicle has to be comfortable as well in order to bring about an easier ride.